Looks as if it might be (and I sincerely hope it is) a Morane Saulnier Type L or Type P.
Dej, I'm putting my money on your Morane-Saulnier Type L guess. Me too - here is one with skis from Russia. Christ! Look at that rudder, though. Enough to put the fear of God into any potential pilot, no wonder it flew like a brick! And of course, the RAF at Farnborough was inspired, the dangers of too small a rudder having been fatally demonstrated by said Morane, to repeat the mistake on the RE8... from Moranes to Morons in one fell swoop! Morane Saulnier Type L Parasol it is. A welcome addition to OFF and a very important aircraft it was in the early years. This is the aircraft that Cecil Lewis famously (well for WW1 buffs) wrote about in Sagittarius Rising in which he side-slipped precariously over a hanger on take off and almost ended his career in the RFC before it had begun. It was not a great performer but innovative with the parasol configuration ideal for observation. Now here's a pic of a real seat of the pants heavier than air flying machine. How'd you like to have a go in this little baby ! Lol Catch wondered how long it would take anyone to notice the little pic. Now that last one is interesting, imagine flying that just about in the air.. then someone starts firing a revolver at you. Looks like the one from 'Those Magnificent Men in their Flying Machines' film - was it the French or Italian pilot? It was the French. I love that movie. Was a very relaxed time, and they made a wonderfully funny movie. Here is some of it. The second in memory of the great actor Gert Fröbe. That abomination of an aircraft in Catch's picture makes the Morane-Saulnier look like a state-of-the-art killing machine. It is indeed a great movie and one of my faves. That scene of all the old kites flying over Dover and heading across the channel is stunning. It was the French pilot who flew the "demoiselle". The above picture I found by accident while searching for Morane Saulnier info. I think it's incorrectly titled as a Morane Saulnier aircraft. 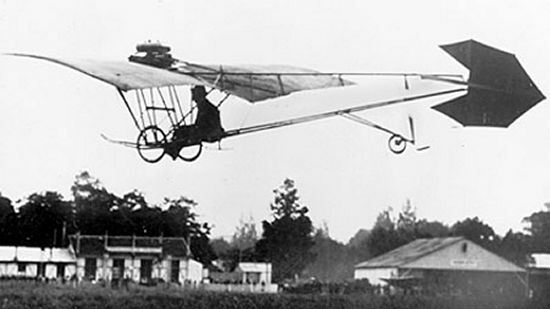 In any event, if it is, it's heavily copied from Santos Dumont's lovely little Demoiselle, the first ultralight of 1908/09 ! The replica in TMMINFM was pretty accurate except for modern safety features (er like ailerons instead of warping for instance). This pic I believe is Santos Dumont flying the real thing circa 1908/09. Here is one that I found most beautiful, cause it looks like a copied bird: the Reichelt Eindecker from 1913. 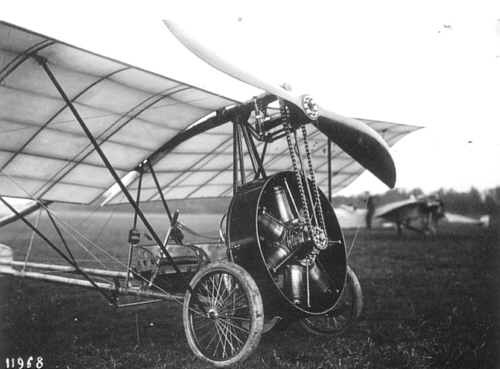 And this is the Grade Monoplane from 1910 - what a time it must have been. The air was yet a space for pioneers. Yeah, pilots always had to have hawkeyes - and balls of steel! I wouldn't be at all surprised if some of the early aviation pioneers didn't have balls at all after a few crash landings. Speaking of the Morane Parasol, I really hope Pol is not only teasing us with his avatar and we do get the plane in P4. If you browse through Entente squadrons in the OFF enlist new pilot screen, you'll instantly notice just how many of them used the Morane-Saulnier, and many for very long periods of time. It would be a very important addition to the early war planes in OFF. Yeah, and many a curse for the designer ...course they were probably one and the same!